I have to confess, one of the things I like most about traveling for business is that it usually means a long period of time during which I’m unreachable. The mobile phone is shut off, and I don’t have internet access so I can’t answer email. I’m free to take a nap or read a book while I’m in the air. Well, no more. JetBlue is moving to do away with my mile-high refuge by making wi-fi internet available in-flight. JetBlue Airways Corp. won a government auction Friday for wireless spectrum that could be used to provide in-flight telephone, Internet, or entertainment services. 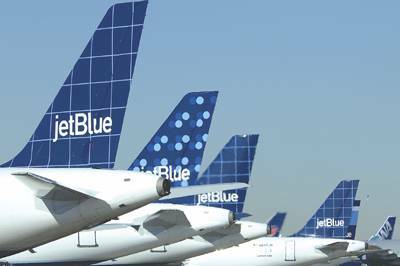 The winning bid of $7.02 million was placed through New York-based JetBlue’s entertainment subsidiary, LiveTV LLC, which provides DirecTV service on JetBlue flights. The licenses will not mean travelers can use their cell phones in the air, but between instant messaging and the avilability of free Skype calls in the U.S. and Canada, who needs to use their movile phone in-flight. This entry was posted on Monday, June 5th, 2006 at 12:37 pm	and is filed under Cool Stuff. You can follow any responses to this entry through the RSS 2.0 feed. You can leave a response, or trackback from your own site.